Rexel Nyrex C/F Fldr A4 Clear 12153 Pk25 Pack of 1 Rexel Nyrex Cut Flush Folders. Premium quality folder with reinforced edges and thumbhole for easy insertion and removal of documents. Open top and side with a lightly embossed finish, reducing glare and finger marks. Size A4. Colour - Clear. Rexel Cut Flush Folder A4 Clear Pk100 Pack of 1 Rexel Copyking Folders, ideal for everyday filing. Manufactured from polypropylene which prevents copy being lifted and the slightly embossed finish reduces glare. Open two sides with thumb hole for easy access to documents. A4. Clear. 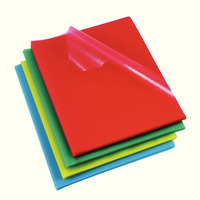 Rexel Cut Flush Folders A4 Asstd Pk100 Pack of 1 Open 2 sides. Cut flush with thumb hole. Made from embossed polypropylene to help prevent off-setting from photocopied or duplicated material and reduce glare. A4 assorted. Assorted shown. Rexel NyrexFolders Clr C/Back A4 12121 Pack of 1 Rexel Nyrex Cut Back Folders. Premium quality folder with reinforced edges, cut back front and thumbhole for easy insertion and removal of documents. Open top and side with a lightly embossed finish, reducing glare and finger marks. Size A4. Clear. 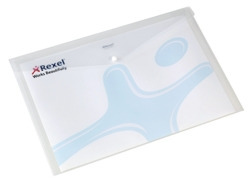 Rexel SuperFine Folders A4 Rsf Pk100 Pack of 1 Rexel Superfine Folders. Cut flush, lightweight folders, open two sides with cut out thumb hole for easy insertion and retrieval of papers. 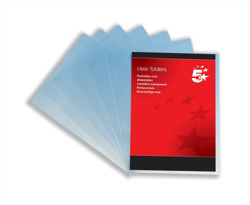 Manufactured from crystal clear polypropylene ensuring clarity of contents and guaranteed copy safe. Size: A4.